Here at Squash, we provide weekly, monthly or one time treatments for all types of pests, and properties. Treatments include, rodents, roaches, flies, ants, bedbugs, termites, and more. We also offer a green treatment for bedbugs, using a freezing treatment Cryonite® that is non-toxic and child friendly. 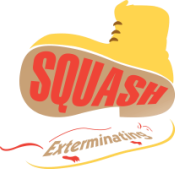 With nearly a decade of experience, Squash can solve your issue and eradicate these unwanted pests for good. Give us a call, our friendly customer service and experienced technicians will turn this ugly process into a pleasant one.